Smile because your heart is open, smile because you know you have people who love you and support you, smile because you have your health, smile because you are grateful for the body you live in, smile because you have a job, smile because you have passion, smile because you know who you are, smile because there are infinite possibilities in front of you, smile because you’ve travelled, smile because you’ve survived heart break, smile because you’ve changed and grown stronger and learnt from your mistake, smile because you are alive and loved. This smoothie bowl will put a smile on your face and your baby's face too. It takes 2 mins to make, is vegan, dairy free & gluten free. Blend the aforementioned ingredients and add your toppings in the form of a smiley face (as seen above) with fresh blueberries, grapes and half a strawberry. 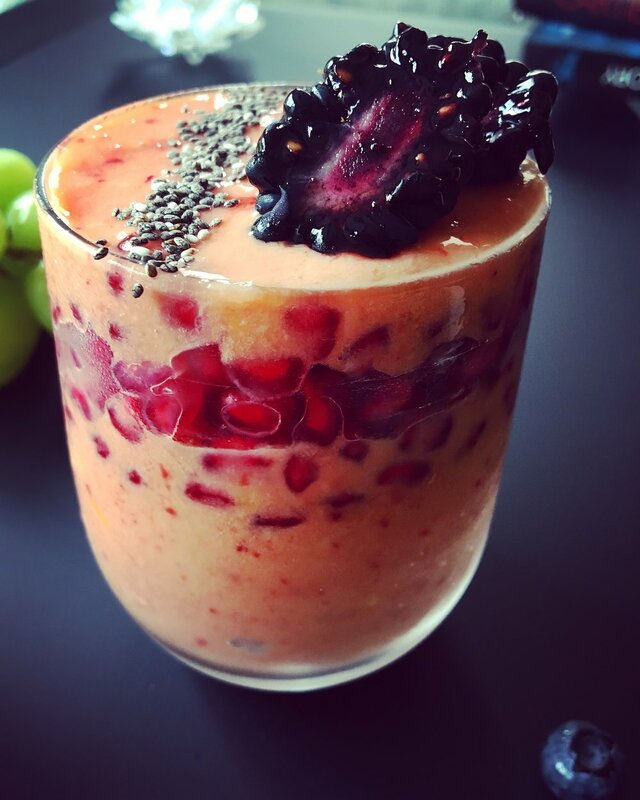 Or, make the 'adult' version is in a cup with pomegranate seeds & blackberries. Although I find the first option more fun, the choice is yours!